Seal the meat in a pan with a little oil. Add salt, onion, cloves and saffron dissolved in the juices. Cook until the onion is transparent. Cover with 3 c water. Bring to a boil and simmer 30 minutes until the meat is tender. 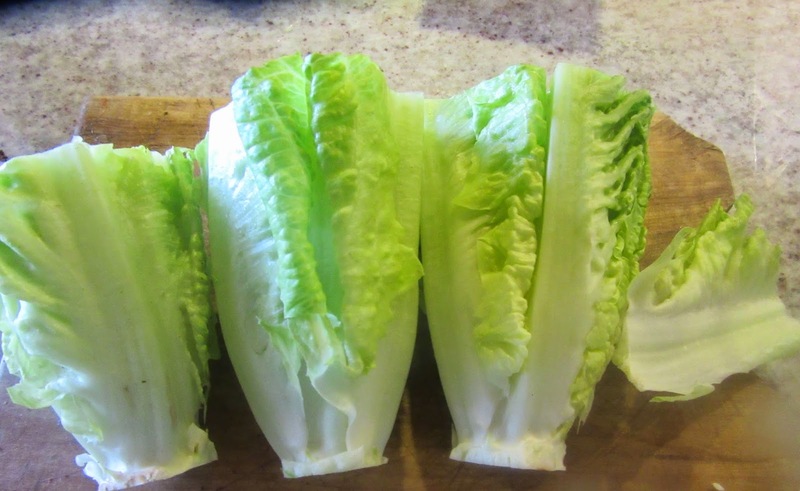 Remove outer leaves from hearts of lettuce and quarter them lengthwise. Add them to the pot. Add vinegar and mix. When the leaves have wilted, thicken the sauce with slightly beaten eggs, add more mashed and dissolved saffron if necessary and sprinkle with lavender. Remove from heat and cover until the egg solidifies. 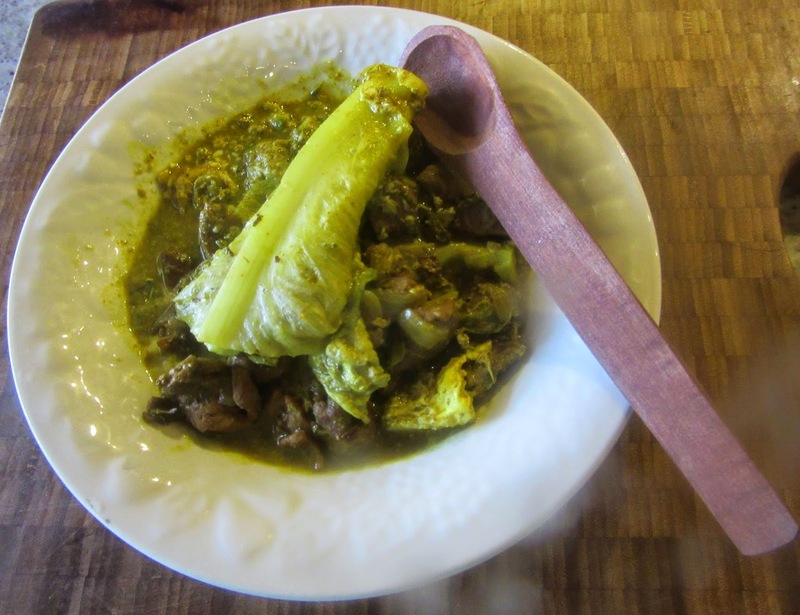 Se toma carne de carnero tierna y gorda, se corta en pedazos pequeños y se pone en una olla con sal, un pedazo de cebolla, pimiento, cilantro seco, clavo, azafrán y aceite; se pone a un fuego moderado y cuando está casi en sazón la lechuga, se le pone vinagre bueno y cuando acaba de cocerse, se espesa con huevo batido, azafrán y espliego y se saca al rescoldo. Take meat from a young, fat sheep and cut it in small pieces and put it in a pot with salt, a piece of onion, pepper, coriander seed, clove, saffron and oil. 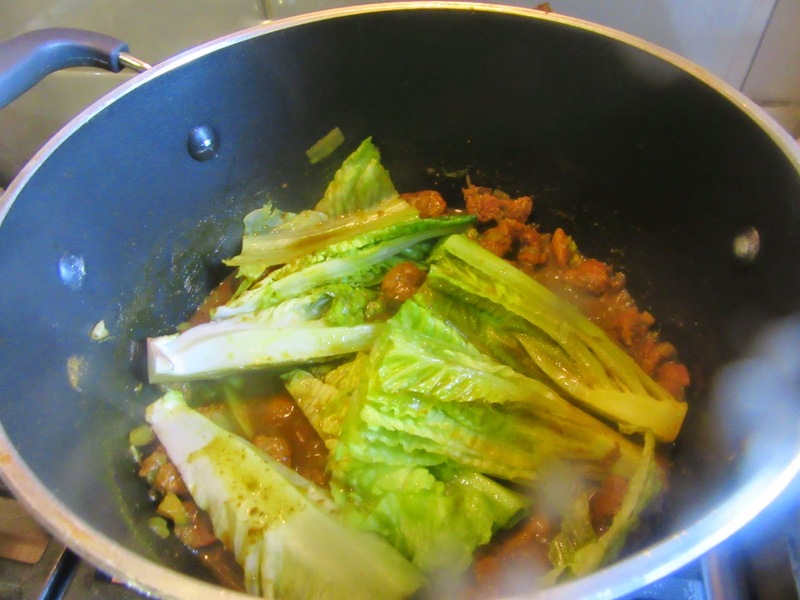 Put it on a moderate fire and when it is almost done, take heads of lettuce and their shoots without leaves, peel and cut up and add to the meat in the pot, and when the lettuce is done, add good vinegar and finish cooking it. Cover it with beaten egg, saffron and spikenard and take it to the hearthstone. A Medieval Spanish Chef’s addition.